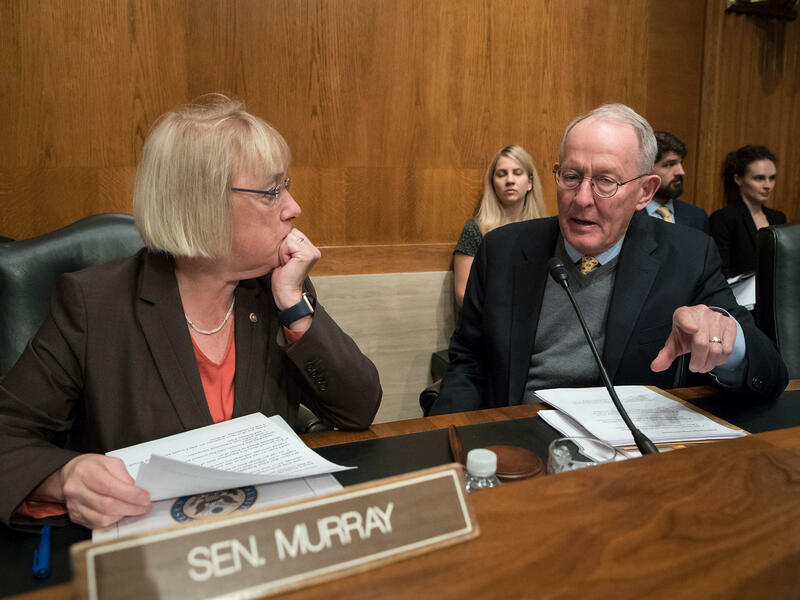 Sen. Patty Murray, D-Wash., the ranking member, and Sen. Lamar Alexander, R-Tenn., chairman of the Senate Health, Education, Labor, and Pensions Committee, meet before the start of a hearing on Capitol Hill in Washington, Wednesday, Oct. 18, 2017, the morning after they reached a deal to resume federal payments to health insurers that President Donald Trump had halted. The lawmakers are up against both a legislative clock and the insurance companies' timeline. Insurers have until summer to decide if they want to continue to sell policies on the ACA marketplaces, but many start making preliminary decisions as early as April. Without action, insurers say premiums will go up in 2019 due to the uncertainty. Consumers and the government would share those costs. It is by no means clear whether any package could gain the votes needed in the House and Senate. Most Republicans are loath to be seen "fixing" Obamacare, although opinion polls clearly show they will be blamed for problems with the law going forward. Pressure to improve the situation is being felt beyond Capitol Hill. Last week five governors (three Democrats, one Republican and one Independent) released a blueprint for a health system overhaul that includes several of the stabilization ideas under consideration in Congress. Lawmakers in D.C. are looking at two primary fixes, although they could be combined. One, pushed by Sens. Susan Collins (R-Maine) and Bill Nelson (D-Fla.), is called reinsurance. This is a fund that would help insurers pay for the sickest patients and would guarantee the insurance companies do not face large losses. The idea is that if insurers don't have to worry about covering the expenses for their highest-cost patients, they can keep premiums lower for everyone. The ACA had a temporary reinsurance program from 2014 to 2016. It was intended to help insurers get started in a market where sick people were able to buy their own insurance for the first time. Prior to the law, most insurers did not cover many people with preexisting health conditions. If they did, it was at an extremely high cost. Since the federal program ended, several states, including Minnesota and Alaska, have adopted, with some success, their own reinsurance programs in an attempt to hold premiums down. The other proposal, negotiated by Sens. Lamar Alexander (R-Tenn.) and Patty Murray (D-Wash.), would guarantee insurers would get money that the Trump administration cut off in October. The senators are advocating reinstating federal reimbursement for so-called cost-sharing reduction subsidies—discounts that the ACA requires insurers to provide to their lower-income enrollees to help reduce their deductibles and other out-of-pocket costs. Senate Majority Leader Mitch McConnell (R-Ky.) pledged to Collins, in exchange for her vote on the GOP tax plan in December, that he would support bringing both bills to the floor for debate. That has not happened. Although, in a statement, Collins said she is "continuing to have productive discussions" with Senate and House leaders about both bills. Meanwhile, a lot has changed, including new questions about whether the fixes would work. State insurance regulators managed to find a workaround for Trump's sudden cancellation of the federal cost-sharing payments. The cancellation made some premiums higher but the subsidies the federal government gave to consumers also increased to cover those higher prices. That's because most states allowed insurers to offset the loss of these funds by attaching the premium increases to the plans that determine how much in subsidies enrollees get to pay those premiums. The result is that most people who get government help pay the same (or, in some cases, less), while insurers are effectively being paid back. That means, however, if the cost-sharing reduction payments were reinstated for 2018, as the original legislation called for, insurers would have to give the excess money back to the government. Analysts agree that would only add to the confusion. Restoring the federal payments for this year, says Joseph Antos of the conservative American Enterprise Institute, "does not lower premiums this year, so it does absolutely no good to the average person." Some advocates have suggested that Congress should guarantee the payments for 2019 and 2020. But Antos says that "also makes no sense because the insurers would then think 'Are we going to go through this again?' " They might raise premiums even further to make up for the uncertainty. Antos — and many other analysts — agree that instead, restoring or creating a new reinsurance program would likely do more to control premium increases. Reinsurance "will protect premiums for the people who are actually most subject to them," says Sherry Glied, a former Obama administration health official now at New York University. She was referring to those in the individual market who do not get government help and have been footing large premium increases for the past several years. That's because having protection against the largest bills would allow insurers to lower premiums across the board. Then there are the political considerations. Many Republicans in Congress have called the cost-sharing reduction payments, in particular, a "bailout" to the insurance industry and are resistant to reinstate the payments. Instead, they seem more amenable to the idea of reinsurance, because they consider it a type of "high-risk pool," which they have been pushing for years. House Speaker Paul Ryan said at an event in Wisconsin in January that "I think there might be a bipartisan opportunity there to get risk pools, risk mechanisms." But Republicans have made clear they want something in return for what could be considered a "fix" to the health law they despise. Health and Human Services Secretary Alex Azar was careful to say in a meeting with reporters last week that the Trump administration has no formal position yet on the stabilization efforts. But, he said, "I think it would need to be part of an entire set of reforms there that we would want to see." That would likely include more flexibility for states to opt out of some of the health law's coverage requirements. The delay has made Democrats more demanding, too. The repeal of the ACA's penalties next year for people who don't have insurance has changed the situation dramatically, says Sen. Murray. "As I have made clear, the bipartisan bill I originally agreed on with Chairman Alexander will not make up for this latest round of Republican health care sabotage," she said in a statement. "In fact, there are changes that now need to be made to our bill to ensure it meets its intended goals of keeping premiums down and stabilizing markets." But while Congress decides if it will take action, insurers are warning that doing nothing will lead to still higher premiums. Premium rates for a "benchmark" silver plan could rise by 27 percent in 2019, the Blue Cross Blue Shield Association said earlier this month. Congressional action on reinsurance and cost-sharing, the association predicted, would help push premium rates 17 percent below this year's levels. "Health plans are looking for certainty in the market," said Justine Handelman, senior vice president in the association's policy arm. Ideally, Congress would include the funding in measures adopted this month, said Handelman, who spoke with reporters during a briefing at the association's Washington, D.C., headquarters: "Most plans are filing premium rates by April." KHN senior correspondent Julie Appleby contributed to this story.